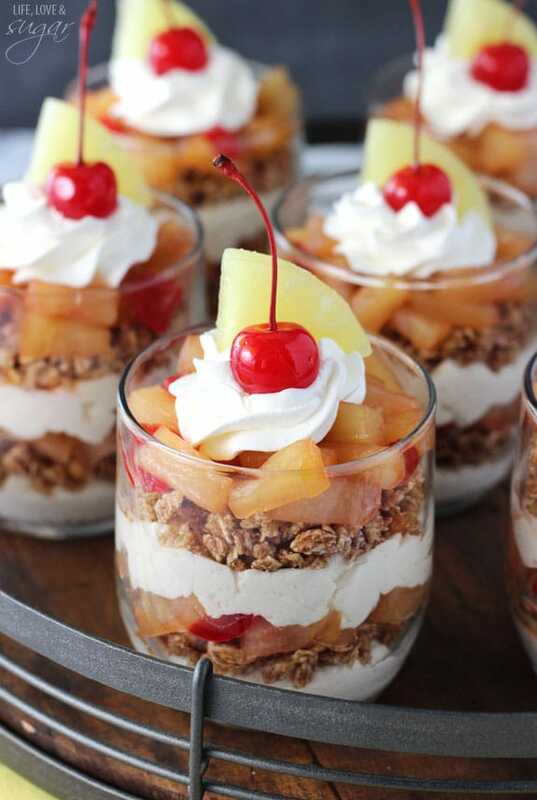 These Pineapple Upside Down Trifles are delicious layers of caramelized pineapple, no bake cheesecake and cinnamon granola! They are wonderfully easy to make and are perfect for celebrating today’s occasion! What’s the occasion? 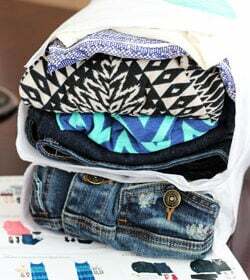 Today I and a handful of other bloggers are celebrating Ashton from Something Swanky’s virtual baby shower! She is due very soon with a baby boy, so join me in congratulating her! I have long loved Ashton’s blog and she’s just as sweet in person as she is on her blog. Plus, she’s a fellow North Carolina native and sweets lover. 🙂 Her and her husband already have an adorable little girl, so I can only imagine how adorable this baby boy will be. 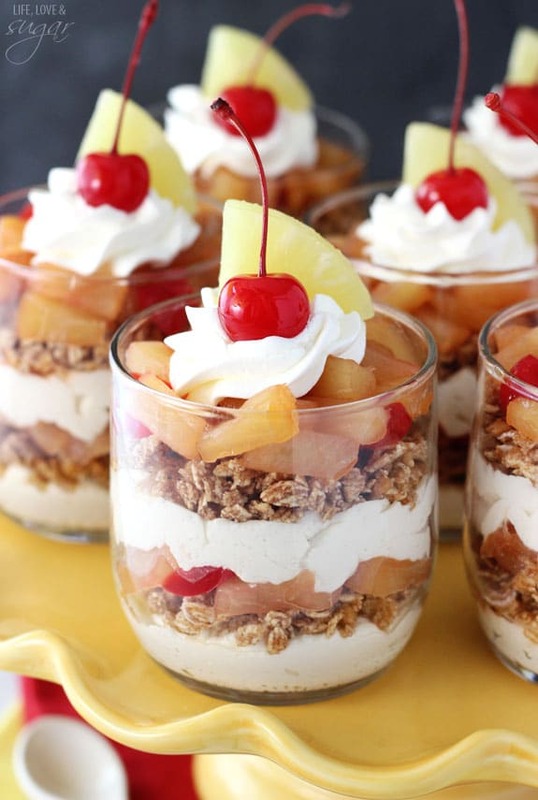 To celebrate the occasion, I brought these Pineapple Upside Down Trifles to the virtual party. 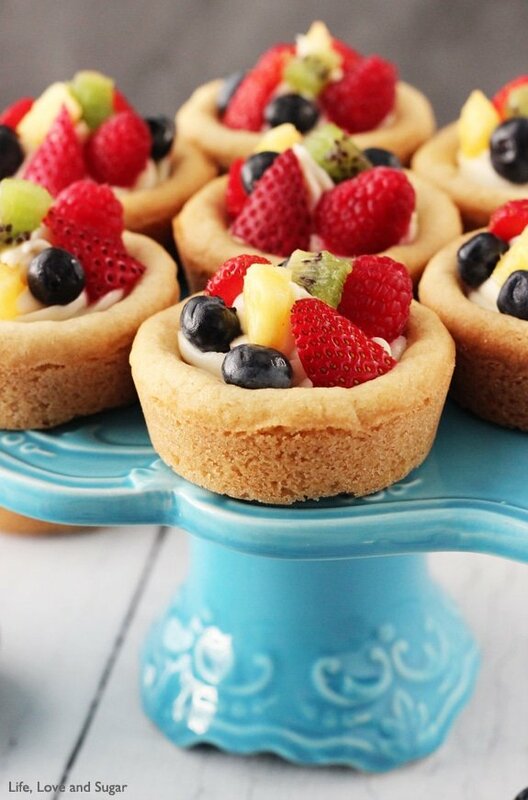 They work great for an occasion like a baby shower given that they are individual desserts, but would also be great for any time. They are really easy to make, which is great if you have a whole party to prepare for. A lot of the great flavor that comes in a pineapple upside down cake is from the pineapple that caramelizes in the butter and brown sugar while the cake cooks. All that delicious-ness bakes into the cake too, giving it that moist, wonderful flavor. I wanted to make sure I kept that caramelized element in these trifles. So to start, the pineapple layer is made by cooking the fruit in butter and brown sugar. It softens the pineapple and gives it that caramel-y flavor that is so wonderful. I added some chopped cherries to it, because I love them in the cake, but they could be left out if you aren’t into cherries. 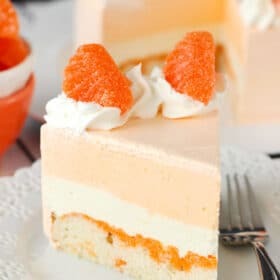 The cheesecake layer is a no bake cheesecake that has some brown sugar and pineapple juice in it, further reinforcing the wonderful flavors of the classic cake. It’s easy to put together, as it’s all just combined with a mixer and then added to the trifles. I layered my trifles with a cinnamon granola, but you could also use pound cake or angel food cake if you preferred. I love the crunch and extra flavor from the granola personally. It also softens up a fair bit when the trifles are refrigerated so it ends up adding great texture, without being too much crunch. 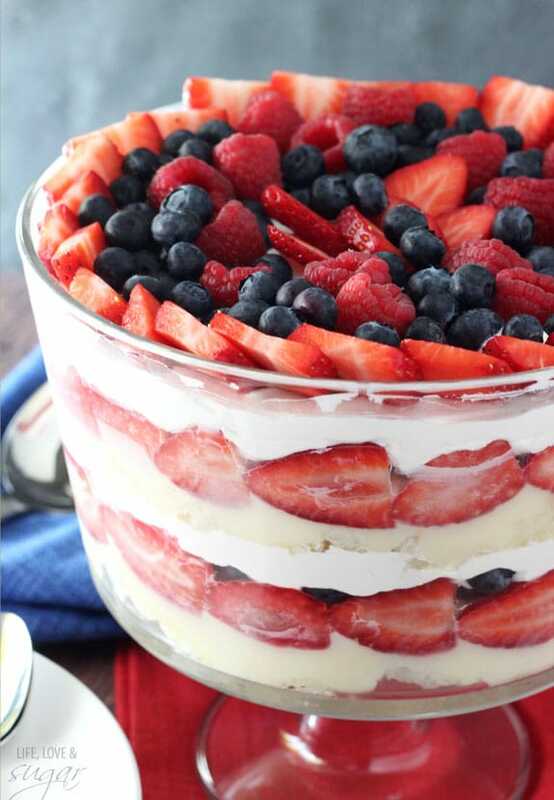 To layer the trifles, alternate adding each of the three layers. You should end up with two of each layer. The glasses I used are little 8 ounce glasses that work great. You could also use the 8 ounce size mason jars. They’re a little smaller than the typical mason jar and I usually can find them pretty easily at Hobby Lobby. And once again, congratulations Ashton! Be sure to check out the other recipes served at Ashton’s virtual shower today! 1. Drain the pineapple juice from the cans and reserve about a 1/2 cup of the juice for later. 2. To caramelize the pineapples, add the butter to a medium saucepan on medium hight heat and melt. 3. Stir in brown sugar, pineapple tidbits and cherries. 4. Cook on medium-high, bringing to a simmer, for about 5-10 minutes or until pineapple softens and takes on the caramelized color. 5. Remove from heat and set aside to cool for about 15-20 minutes. 6. To make the cheesecake, add cream cheese, brown sugar and 4 tbsp pineapple juice to a mixer bowl and beat until smooth. 7. Stir in 4 oz of Cool Whip. Set aside. 8. 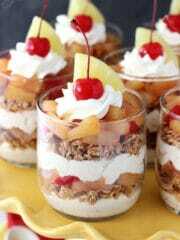 To layer the trifles, first drain the juice from the cooked pineapple and add to a separate bowl. Add 2-3 tbsp of pineapple juice reserved from cans and stir together. 9. Add a layer of cheesecake to the bottom of each glass. 10. Top cheesecake with granola, then sprinkle a little bit of the pineapple juice from step 8 over the granola to give it a little more flavor and help soften it. 11. 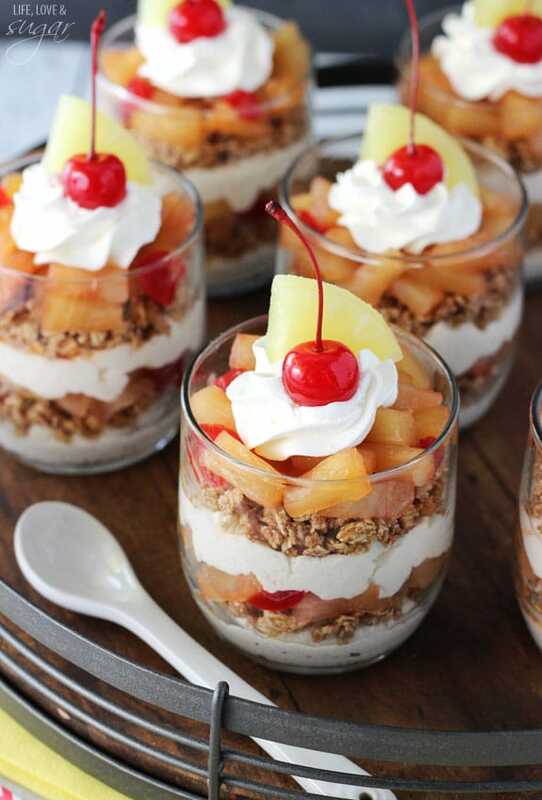 Top granola with a layer of pineapple. 13. 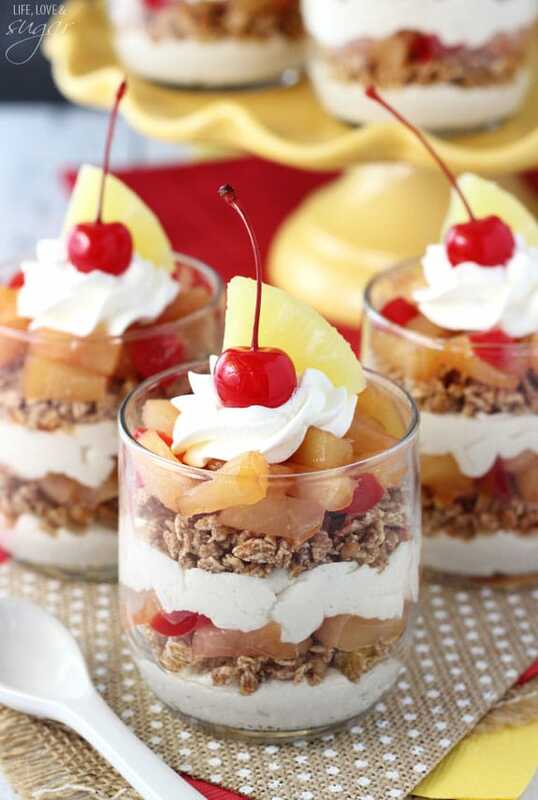 Top trifles with some Cool Whip, a cherry and a piece of pineapple, if desired. Refrigerate until ready to serve. Trifles best for 2-3 days. Very sweet to do this for Ashton. I’m sure she loves it, and it looks great! Ashton is so fantastic! These are seriously such a beautiful way to celebrate with her!! Lindsay, it’s like we’re on the same wave length! You posted your awesome orange creamsicle cake this week and I shared an orange poppyseed cake, now you have pineapple upside down trifles and I have pineapple upside down monkey bread coming! This is definitely something we’d devour! 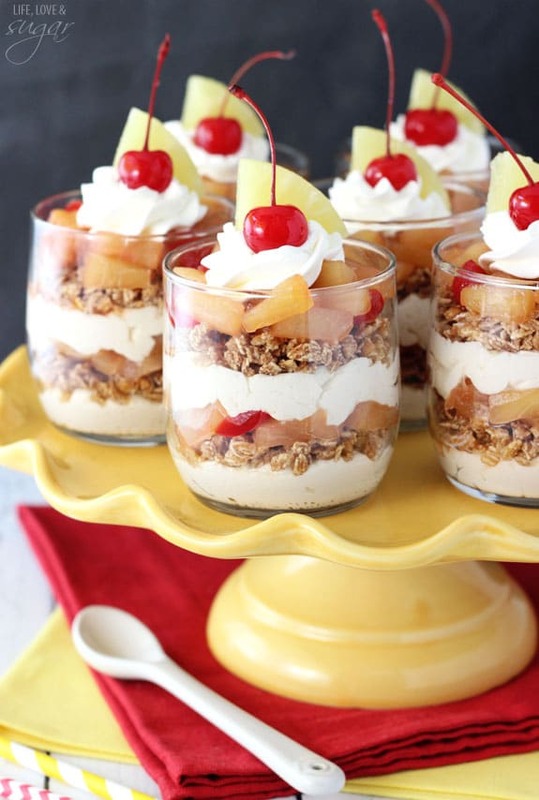 This virtual baby shower is the cutest thing ever 🙂 And your pineapple upside down trifles… I’d love to eat one right now, they look amazing! 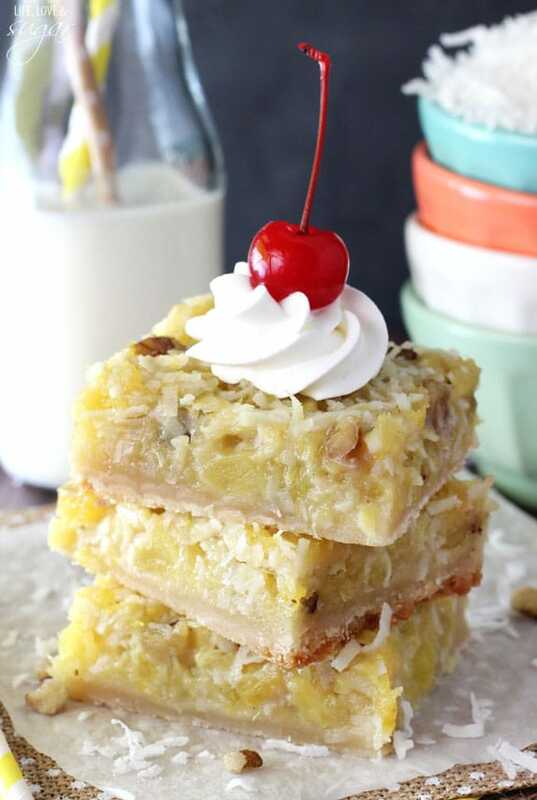 I’ve never been completely on board with pineapple upside down cake, but these look fantastic! Is there a granola brand or recipe you can suggest? I’m dying to try the cheesecake layer with the pineapple juice and brown sugar. Yum! Dang girl! You outdid yourself with this trifle! This is such a great twist on upside down cake. 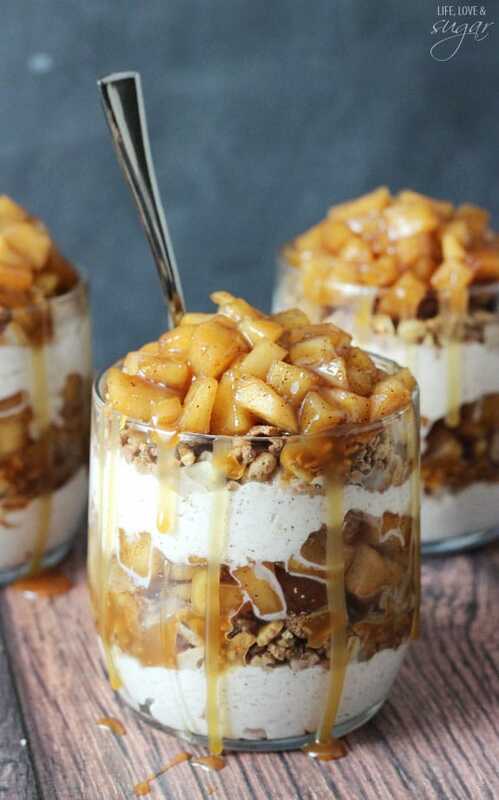 LOVE the granola in there! Such a fun way to switch up the pineapple upside down cake! I love trifles, and this one is genius. I mean since it has fruit and granola I’d consider it a breakfast food 😉 Looks delicious and SO PRETTY!! I love pineapple! 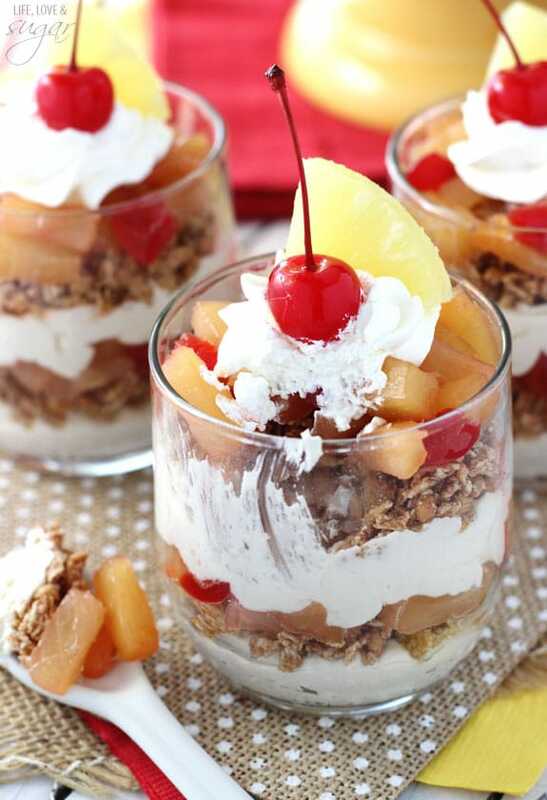 These trifles look gorgeous Lindsay!